Northern Mariana Islands with its capital Saipan is located in Oceania (Oceania, islands in the North Pacific Ocean). It covers some 465 square kilometers (2.5 times the size of Washington, DC) with 52,263 citizens. Tagalog, Chinese, Chamorro and English are the languages commonly used by the people in Northern Mariana Islands (consider regional differences). This country shares no land borders with another country. Northern Mariana Islands is a commonwealth in political union with (and in practice, close to a territory of) the United States. The Marianas' top activity among Americans is scuba diving and snorkeling. In additional to the coral reefs you might expect, the waters around the islands were the scene of fierce fighting during World War II and there are many ship wrecks and even rusting tanks stuck on the seabed. Many Asian (particularly South Koreans) visitors come to the CNMI for gambling (especially on Tinian), and karaoke/hostess bars. Saipan has a thriving (but illegal) prostitution industry, most of the workers being from China or the Philippines. To reach someone Northern Mariana Islands dial +1-670 prior to a number. The local cellular networks are operated on 850 MHz, 1900 MHz, 3G. Websites typically end with the top level domain ".mp". If you want to bring electric appliances (e.g. battery chaarger), keep in min the local . The sign for the locally used currency Dollar is USD. 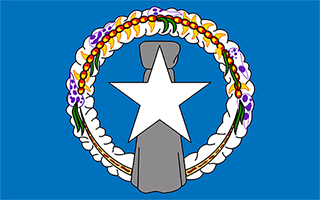 Blue with a white, five-pointed star superimposed on a gray latte stone (the traditional foundation stone used in building) in the center, surrounded by a wreath; blue symbolizes the Pacific Ocean, the star represents the Commonwealth; the latte stone and the floral head wreath display elements of the native Chamorro culture.